Jamaica’s reggae grouping of Morgan Heritage is finally coming to Malawi this December as evidenced by a 28 second video that has been posted by Born Afrikan on his Facebook account. Born Africa, a Malawian reggae artist based in South Africa has posted the video as one way of strengthening his claim about Malawi’s Morgan Heritage concert, failure which could have reduced the news to a mere rumor. In the video which Malawi24 has had an eye of, three of the Morgan Heritage members in the name of Peter, Mr Mojo and Gramps, the trio confirms their coming to the warm heart of Africa. Peter, the group’s leading vocalist, plays the mouth piece role in informing the public about the concert. 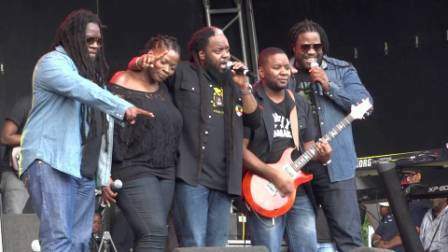 Morgan Heritage to perform in Malawi. “Bless up East Africa, Malawi particular, know that Morgan Heritage is coming, Christmas week, 2015, December, stay tuned to the social media and you will get all the information,” says Peter as he stands between his two brothers. Morgan Heritage has released hits like, how come, liberation among others. Not only are they dear to reggae fans but their music has been embraced by people who listen to different music genres across more generations. Born Africa is responsible for bringing to Malawi a veteran reggae artist, Luciano late last year. Malawian is this year blessed to host two Jamaica’s reggae maestros the other being Busy Signal who will be performing at Sand Music Festival in Salima, later this month. As for the date of the Morgan Heritage concert, Malawi24 will inform the public once it has been set. here comes the kings. i cant wait. Wow! Big tings agwan! Big up Bwan Afrikan, you rock bigtime! Morgan ndiye koma Gawaundi ayi.